Hearing the story of the 10 lepers whom Jesus healed (and only one came back to say “thanks,”) reminded me to say thank you, Jesus. Thank you for every day, every sunrise, every received smile from my child, every swallow, and every breath. I hope to always live in gratitude, but 2007-2009 marked years for which my “thank You, Jesus!” gained weight. As I reminisced in writing this story, many of the emotions came back to me –the tears, the stress and the gratitude for friends. I need an acknowledgement section in a future letter!! The arrows that stuck in my husband’s back seemed to attract more arrows from other angles. I felt myself crumbling with stress, and yet, crumbling with guilt for feeling stressed. Didn’t I trust that God already had this battle for us?! To my right, the “friend” who stole our Jeep would be in jail, but the broken trust cut deeply. At my left, I could see the addiction was destroying everything she had known, yet her blindness made her plow forward not recognizing the monster sleeping within her hobby. Behind me, I felt the pressure of those Michigan neighbors whose jobs were tanked with the economy. Their children were yanked from my children’s teams, as payments for activities got cut with the family budget. My headaches began so subtly, it seemed I could assign the cause to anything – and thus, “the headache dance” began. I could blame it on stress, lack of sleep, hormones, too much sugar, not enough sugar, too much fake sugar, caffeine, not enough caffeine, not exercising, wrong exercising, not enough water, not enough vitamins, busyness of homeschooling two children while entertaining my 2 and 4-year-olds, all while adapting to a new house in the boondocks of Michigan. My list of reasons for the headaches was enough to give me one. 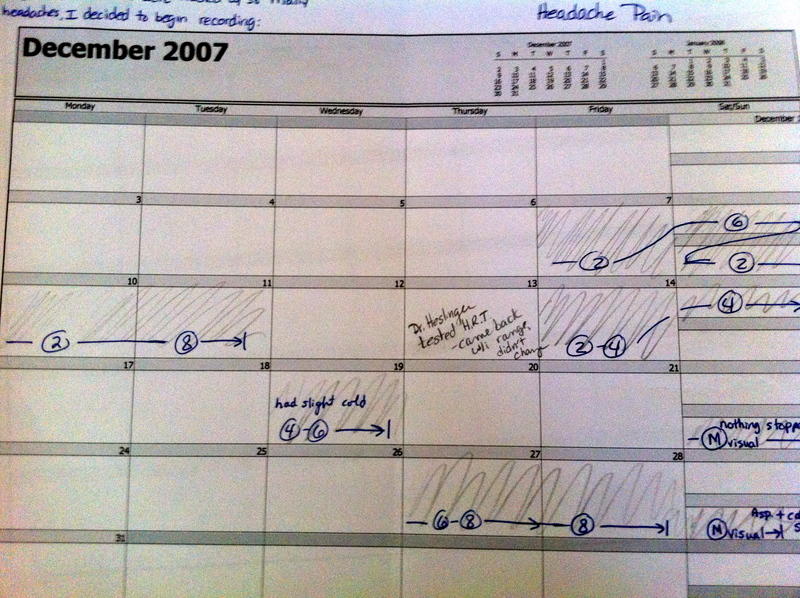 The scientist in me eventually began a journal – a simple calendar with a note each day, labeling the pain between 1 and 10. Were headaches really ruling me as much as it seemed? 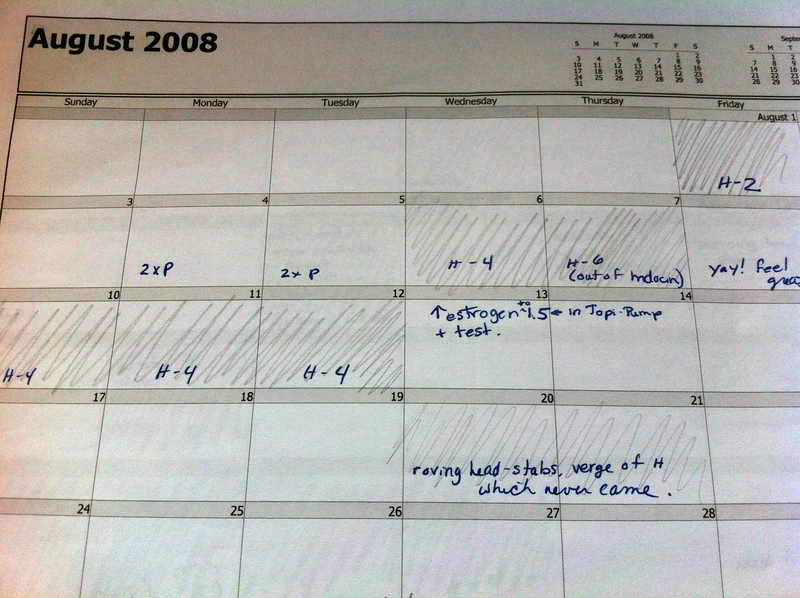 The journal began in December 2007. The grid told the story: five days in a row of level 2 pain, spiking to level 8, then a day or two off. Then blindness, followed by a 24-hour migraine. Then bliss. Then a couple days of level 4 pain, ended by forcing myself to bed at level 6. There were some days I couldn’t remember what it felt like to be without pain, and other days when the pain was so distant, I would forget the underlying worry. To stay focused on others, I don’t like to talk about medical conditions. Besides, stating, “I have a headache,” only reminded people to tell me about their headaches, and did nothing to relieve my pain, much less bring glory to God. Because my husband frequently travels, I knew if he knew my pain he would feel worse about leaving. But in the hot-tub, as I scrunched down, trying to heat the nape of my neck, through tears, I put up the white flag of surrender and told Chris I couldn’t handle my life. Aside: We can’t handle it. God does. When we forget, He’ll remind us – sometimes gently, sometimes more painfully. They were not “headaches”, they were truly “head-pains,” I told him, not sure what I wanted him to say or do about it. We wintered in Florida that year, and I had hoped the climate change would bring relief, but it only got worse. “80% of women complain of headaches with no known cause,” the urgent care doctor deflated my hope, after I drove myself there for immediate relief once when Chris could stay home with the kids. “Eyesight causing headaches is a rarity,” said the eye doctor after an extensive exam. “Hormonal headaches are something many women just have to deal with post hysterectomy,” the OBGyn told me before changing my HRT prescription. I waited months and drove hours to see highly recommended holistic specialists. My prayer journal was filled with prayers for ME. God brought friends who randomly offered to take my kids without truly knowing the extent of my situation. In March, I finally poured out my heart to my friend Donna Ascol, and asked for prayer. Matthew 18:19 in action. A flight to Atlanta and then a subsequent flight to Canada that April put me over the top. I was sure my head would burst from the pressure changes; I prayed I would lose consciousness. Wow. Tears flow today – just in remembrance of trying to keep my world turning that year. My responsibilities didn’t stop – and I didn’t call “May-day!” because it felt like we all have headaches or some other issue we have to push through. However, I promised myself to continue the medical search for a solution, once we returned to our regular doctors in Michigan at the end of April. In the mean time, a noise began in my head. I researched “ringing in the ears,” on the mighty online doctor, who of course told me there was no cure. The “ringing” turned into a chain saw. A grinding. Daily. Sometimes it was louder, sometimes quieter, sometimes silent. I never noticed it starting, so it must have been gradual (or I was too distracted by head pains to notice), but I never noticed when it stopped. It just came and went, and eventually I would notice its presence or lacking. “Grrrrrrrrr” went between a whisper and a scream in my right ear. The neurosurgeon was not much older than I, and had apparently seen more brain MRI’s than the general practitioner, because she told me the tumor was actually on my right side. “Is THAT why I have this noise in my ear? !” I blurted, for the first time telling a doctor about the noise, because I hadn’t wanted to mention it to the family doctor; I was surely toying with the psych ward already. I went home depressed, yet not surprised. I knew the chances of finding the cause were slim. I was hopeful, however, because a new hormone replacement was lessening the headaches and the ear noise had virtually disappeared by summer. He removed several more spots between June and August that year. Each time I had the stitches removed, the wound would pop open within a day. The lack-of-healing revealed a pharmacy error. Apparently, my hormone replacement prescription had changed dispensers and been halved, but they forgot to mention to me that I was supposed to take double. The lack of estrogen meant lack of healing, (along with other symptoms) until we figured out the solution. On the way home from an Ohio soccer tournament, I choked on coffee. I know. Who chokes on pure liquid?! Me, that’s who! I poured hot liquid directly into my lungs…and then coughed and sputtered until Chris almost pulled the car off the highway to try to save me. It felt like more and more often, things were going “down the wrong pipe”! We had friends over for a cookout on Labor Day. I was thrilled it lined up to a day without a headache, but unfortunately, laughing was painful. As the day continued, I felt like something was wrong in my lungs. My whole mid-section hurt. It’s funny how I didn’t like to talk about medical issues, and the Lord kept having me in places where it was impossible to hide. I couldn’t breathe without pain. Laughing: not. I spoke shallowly, with much effort. I finally took aside my friend, Susie Hallstrand, an RN and life-saver many times over, and told her what was wrong. She did an assessment and decided maybe not holiday-emergency-room material, but I should see a doctor the following day. Is this what it’s like getting old? 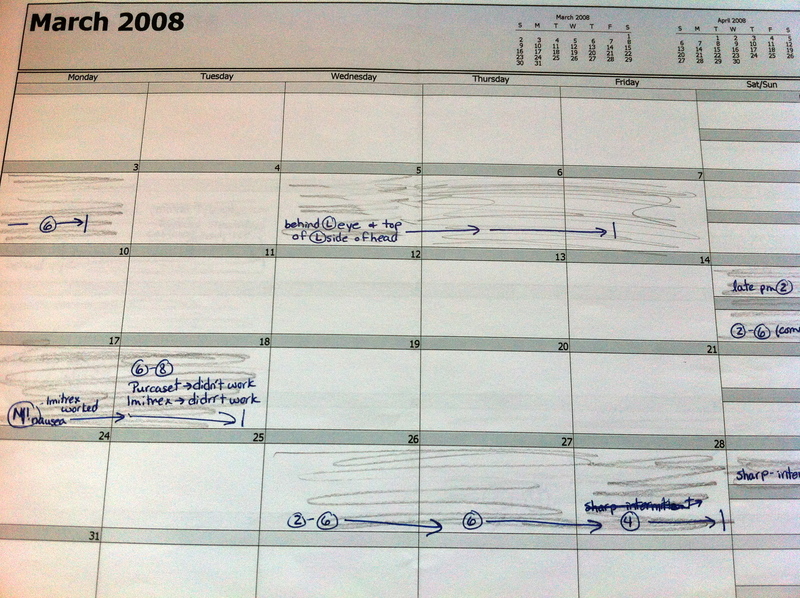 I lamented, as my calendar kept filling with doctor appointments: skin, head, eyes, hormones….BLECH! Back at the family doctor, he named the chest condition- something like sore muscles, usually following severe coughing, like pneumonia. “Sure, that would do it,” he said, and I recalled my wrong-pipe incidents that must have led to my painful breathing. My insurance company went bankrupt. (It WASN’T MY FAULT! REALLY! At least not yet.) As I applied for more insurance, I was turned down. What?! Healthy me? Water-drinking, exercising, prayerful ME?! Reason: skin cancer? Breathing issues? Headaches? What?! I had never seen or heard those words before, so I really thought there was an error. I happened to be talking to my Florida friend, Laurie Woodward that week, who practically begged me to go back for another MRI, despite how I was resisting it. Really, I had all these other problems to deal with – who has time to go spend thousands of dollars on another MRI to check something which they said was not dangerous and unrelated to these other issues at hand anyway?!! I scheduled an MRI for September 6, 2008, a Saturday, knowing my doctor would be on vacation until September 22, the date of my follow-up appointment. Like the Brady Bunch episode in Hawaii with the totem pole guy and tarantula:…..……...to be continued……. This entry was posted in Health of It, Motherhood, Rooted in Faith, Uncategorized and tagged brain tumor, Chris Brady, Headache, Health, meningioma, pain management by Terri. Bookmark the permalink. I so appreciate your transparency and willingness to openly share all of these struggles. Wow, I had no idea how many details there were to this story. The fact that you were still speaking all across the country, and still building your business during this time is awe-inspiring to me. You are a true woman of strength! …we are all waiting with baited-breath for part 2!!!! I appreciate you sharing such a painful and confusing time in your life. I know I am seeing how to walk with God through really tough times by reading it! God is so good, to Him be all the glory! You are an inspiration. Your story really puts into perspective my own life “challenges” not so challenging! And to be a leading lady with kindness and grace while being in so much pain? Wow. Oh My Tumor Sista!!! As I read this tears filled my eyes as it brought back so many memories leading up to my diagnosis! It’s so amazing now I can look back and feel so incredibly blessed to have gone through that tennis ball sized menigioma! I was 3 months out on recovery as your symptoms began! I had to laugh when the doctors said the ringing and other sounds in your ear wasn’t related because I too had the same exact symptoms! I can’t wait for the 2nd part of this blog post! So grateful I was lead into your life and am so grateful for your leadership! You are such an amazing example to me!! You are sweet. No heroine, just One God. That is how this story ends for all of us:) Phil 4:13, girlfriend! How amazing the whole story is, especially when I already know the ending you shared with everyone! And how gracious your public courage in the midst of all this . . . We who saw you on stage never knew a thing . . . Thank you for letting us in. I wonder if you know how deeply your experience touches those of us who love you through Team and L.I.F.E. Thank you for opening this window, and for sharing what must certainly be an emotional roller coaster for you. You inspire us with your faith, positive attitude, and servant heart. As one who watched a loved one fight the cancer battle in the days when chemo-therapy was just another way of saying toxic waste injected into the body, I am so thankful for the hope you shine into the darkness of cancer. I look forward to carefully, thoughtfully and prayerfully walking this journey with you. I love this comment because I believe it to be true!! And I completely believe that Terri lived up to it…with her eyes and heart firmly planted on God. You amaze me Terri Brady and this article was the breath of fresh air I needed today 🙂 I can’t wait for part 2! Thanks for being so open about your struggle….I am grateful that God got you through this! You are a true force for good — you are an inspiration to me and I am also glad you can still talk (for selfish reasons — You are my favorite speaker!!!) Thanks for serving and giving like you do! Hearing your story again makes it all seem so fresh. I will never forget your phone call telling me about the diagnosis, just like you will never forget my hubby’s well-timed text message. 🙂 Looking forward to the “rest of the story” –not just what you will share about this experience, but also what our faithful God will continue to do in your life. Thanks for taking time to share this story. It will certainly glorify God and help so many who may be pondering the idea of seeing “another” doctor. I didn’t know you had all those issues leading up to your surgery. You are so sweet for keeping your struggles to yourself for fear of being a possible burden. Even though I was there for some of “Part 2”, I can’t wait to read how you unveil the details. Love you so much! We are all Blessed by your Words and Sharing the TRUTH, we sometimes want to Hide Away!!! Thank God for your being able to Share this and many more “Truths” (I don’t like to call these Stories, because we experience them Firsthand). Thank you Terri, for sharing your experiences they give us so much hope. I met you once, on a Sunday morning at choir practice and enjoyed talking with you. You are an amazing uplifter. My husband deals with cluster headaches almost daily. The doctors tell us there is no cure and no treatment for them. Prescription drugs have no effect on them, they gave him morphine once, he said it made no dent in the pain. Sometimes he’ll get a combination of Tylenol and an Emv to dull it down. Otherwise we just let him alone in a quit room until it subsides. My faith in Christ has been challenged a time or two as to why is this happening to such a loving and caring man, but it’s been by hearing your story that I have faith that God has a plan for us and I have to trust him even though I don’t understand why. Thank you Terri and Chris for sharing your struggle it gives hope to us all. Terri you are AMAZING!!!!! You serve & you serve through all your circumstances and giving glory to God the whole time!!!!!! You are a true women of strength!!!!!!! Love you very much for the example you are to all of us!!!! Your story of your journey of pain, frustration, and pursuit for answers that preceded the eventual diagnosis is incredible! I had NO idea about the months of pain you endured without relief. Because you’ve been so transparent, others will gain strength and hope for whatever difficulties they are going through. “God doesn’t give us more than we can handle,” Did you ever wonder just HOW much He was going to give you? You handled this with such grace, strength, dignity, and trust. I am SO thankful for YOU! I’m so thankful for your musical talents and that you can still play piano, and SING so beautifully!! I can’t wait to read part 2 – and everyone is right; Chris is NOT the only best selling author in your house! I’m so thankful for you. You are such a blessing, Terri! Terri, thank you so much for sharing your story. Your faith in our God is an amazing example of a woman after God’s own heart! Thank u for shsring this Terrie!!! It helps to put things in perspective!!! Terri, I appreciate that fact that you are sharing this with us. What strength you have shown! You have the ability to make strangers feel like lifelong friends! To go a step further, I believe there are no strangers for you….just friends you haven’t met yet! And you always put your own needs aside so that you can help others! We are truly blessed to know you! Can’t wait for the book to come out! I thank my God that you can enjoy your life and you can tell others how God is Faithful. Seeing your journal… Inspirational. My dad currently is fighting prostate cancer. Lord knows he’s a stubborn Irishman, but also a fighter.